BTW, Where Was ‘The Donald’ Born? Was Donald Trump Born in Jamaica, South Africa or Mexico? 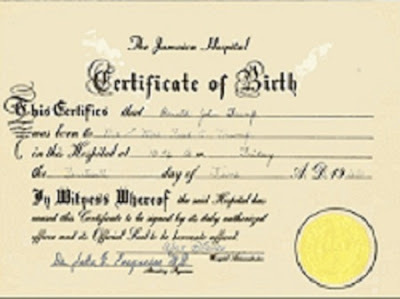 Consider this: Not one person at the Jamaica, New York, hospital where Trump claims to have been born remembers his birth, as far as I care to find out. 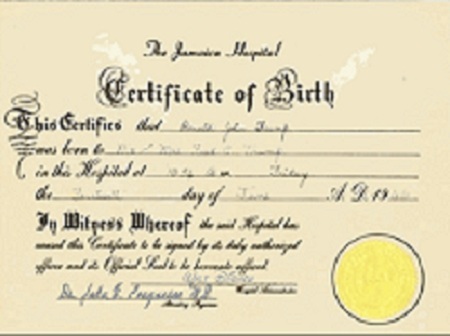 Aside from that, Trump’s alleged ‘real’ birth certificate doesn’t specify it is a hospital in Jamaica ‘New York’ — it simply says “The Jamaica Hospital.” What is Trump trying to pull here, MON? Was he born in de islands and smuggled into dis country? And where are the contemporaneous 1946 newspaper birth announcements for the baby Donald? Obama has provided two; Trump has provided zero. And look closely at the signatures of the hospital administrator and attending physician — are we to believe Walt Disney was running Jamaica Hospital in 1946 and a ‘Dr. John E. Conqueroo M.D.’ delivered Donald Trump? Some malcontents may argue that Dr. Rooney’s South Africa theory is short on facts, but, IMO, what it lacks in factual content it more than makes up for in bold, risible audacity. Besides, how can you argue with a copy of Trump’s real South African birth certificate? Who could possibly have the expertise and desire to forge something like that? This entry was posted in 2012 Election, Conservatives, Humor, Idiots, Obama, Republicans, Romney, Teabaggers, Wingnuts and tagged 2012 Election, Birther Conspiracies, Birthers, Donald Trump, Kevin Rooney, Obama, RS Janes. Bookmark the permalink.